School closes for the Easter break on Friday April 12th, returning after the holiday on Monday April 29th. A Happy and Holy Easter to everyone connected with St Margaret Marys. Welcome to the website of St. Margaret Mary's Catholic Primary School. Our website has lots of information about our school and we hope you find it both interesting and informative. 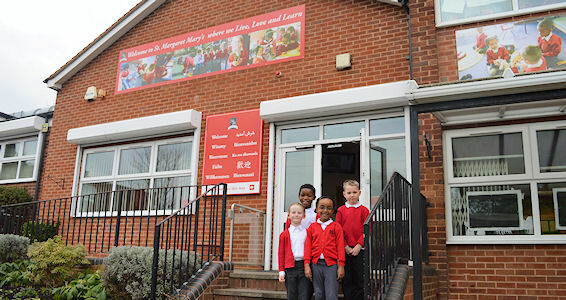 It is updated regularly with newsletters, diary dates and updates about life at St.Margaret Mary's. If you would like to find out more about our school then please don’t hesitate to contact us, and if you have enjoyed your visit to the website, you may wish to leave us a message in our guestbook. Thank you for visiting. We hope to see you again soon. 07 Apr 19: Latest Parish Newsletter. 07 Apr 19: Updated school Governors' Meeting Atendance. 07 Apr 19: A link to our Online Safey page in our footer area. 07 Apr 19: All year groups enjoyed different experiments on our Science Day. 31 Mar 19: School Newsletter. 31 Mar 19: Latest Parish Newsletter. 31 Mar 19: Year 5 learnt about the Ancient Greeks with Professor McGinty. 31 Mar 19: Class 2C brought things from home for their Show and Tell. 31 Mar 19: Year 4 enjoyed a visit to Kenilworth Castle. 24 Mar 19: Latest Parish Newsletter. 24 Mar 18: Class 3B held a Circle Time on different situations. 24 Mar 18: Year 2 held a Circle Time on being good friends. 24 Mar 18: Year 2 enjoyed their Mindfulness Assembly on being kind. 16 Mar 19: Latest Parish Newsletter. 16 Mar 19: Curriculum Overviews for Spring Term 2. 16 Mar 19: Everyone dressed as their favourite characters for World Book Day. 08 Mar 19: School Newsletter and diary dates. 08 Mar 18: Class 1F held another Circle Time on feelings. 02 Mar 19: Latest Parish Newsletter.